What's in a business name? Everything and nothing. The right business name will help distinguish you from a sea of bland competitors, provide your customers with a reason to hire you, and aid in the branding of your company. While a business name won't make up for serious deficiency in your business operations or help you avoid selling, it's important. Apply these tips when choosing a name for your business. It's tempting to abbreviate your business name to make communications and correspondence easier. However, as a small business owner you don't have the resources and marketing muscle to educate your market on what your acronym means. Forget tagging your business name with the moniker such as global or enterprise. Any start-up founder has big visions for their company. You might one day envision marketing to diverse markets and having a wide range of products. Successful start-ups have limited time and money; it's more likely your success in the world of commerce will come from being highly focused in one narrow area. A small company is a specialist; it's why your customer wants you. Don't use, borrow, or modify an existing famous brand name. In Elizabethtown, Kentucky, Victor Moseley used the name Victor's Secret when he opened his adult gift and lingerie shop. Victor's Secret did not remain secret when the legal department of Victoria's Secret sent a letter to Moseley claiming trademark infringement. In haste, the name was changed to Victor's Little Secret, but the change was not enough for Victoria's Secret who then filed a lawsuit. 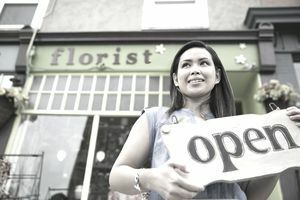 The bulk of small businesses operate in local markets. This doesn't mean your name should be geographically based. If you are marketing to customers in a local market, they'll know you operate locally. Adding your town name to your business name just ensures you will be stuck in a long directory list of other local companies with similar names. If you want a local name, add it to your marketing such as "Exclusively Serving the (town) Area." It's a common tendency for a business to be named after the original founder. If you are planning to one day sell your company, a company owner named business is less attractive to a perspective buyer's than a brand built on a company. Put your business name through the spelling test and ask others to spell it. Yourdictionary.com lists experience, intelligence, jewelry, millennium, and personnel as a few of the top 100 most misspelled words. Consumers are bombarded with business names and advertising on a daily basis. Your job as a successful small business is to make customers remember you. Your website web address should be the same as your business name. Avoid the hyphenated web address names. It's hard enough to remember a web site address without the hyphens. When you have developed a great business name, spend the time to determine if another business isn't using it. You can use a similar name for your business if another company uses it in an unrelated market or industry. Once you have your name, protect it by registering the business name with your county or State office. Your business name should be easy to remember and memorable. Apply the 10 commandments when naming your business and in the end, you'll avoid a marketing disaster.